What does your website--or lack of it--say about your business? Some 52% of Canadians go online to research products, says the November issue of Profit magazine. If your store doesn’t have an effective web presence, you’re going to sacrifice sales, they add. And yet, many small businesses in Canada still don’t have a website. Only 36 per cent of small businesses had their own websites (compared to 91 per cent of large businesses) as of 2007, a recent CBC article reports. I encounter this often, when owners enlist our help to sell their business—many do not have a website. They don’t realize the bad image it conveys—that you’re not professional enough to have a site. And it’s just as damaging if you haven’t kept it current. Think of the website as your online home. Are your premises tired and dated? An effective, well-designed website will give visitors a positive impression of your business. But the site needs to be consistent with who you are or want to be as a business and directed to your target market—your prospects. As with all marketing channels, you need to determine the audience you are trying to reach and with what message—with the ultimate goal of gaining a customer or client. With this in mind, we took a long, hard look at our own Sunbelt Canada website this past spring and realized it didn’t convey all that our company had to offer. So we overhauled the site, to make it more relevant to and functional for our target audience—people interested in buying, building or selling a business--to attract more visits and ultimately, more customers. Instead of just pointing out the improvements, I wanted to share some of the thinking behind the changes, so you too could benefit. 1. We reconstructed our new website around the needs of our target audience, creating categories and navigation based on the key tasks of buying or selling a business. Making it easy for people to find what they come for is critical. People visit your site for specific information, and if they cannot find it they will quickly go elsewhere, leaving with the impression that your business is disorganized in more than just its website. The pages and sections of the site should be easy and logical for visitors to manoeuvre, emphasizes Grace Smith in 5 top web design mistakes small businesses make. And, of course, if your visitors can easily find what they need, good content makes them want to come back for more. 2. We also retooled our existing content, adding new information on financing, valuation and building value, and a wider range of educational materials more reflective of Sunbelt’s leadership of and connections in the industry. We reinforced this positioning with an upfront statement of how owners and potential owners benefit from doing business with Sunbelt and provided more proof points by way of accreditations, testimonials and other related materials. We put great value in our customers’ trust; it’s also a factor online, of course, where people need to get to know you before you can earn their trust. And that’s built as they consume and share your content, opt-in and ultimately, convert by buying something or sending through an inquiry, as Dan Norris describes in 8 features of great small business websites, part 1. 3. Our existing website didn’t offer many opportunities for sharing, opting in or converting. We added a "contact us" form with options for people to connect with us and hear back at their convenience. Making it easy for people to find and contact you is a must—we also have phone numbers and office listings on every page. 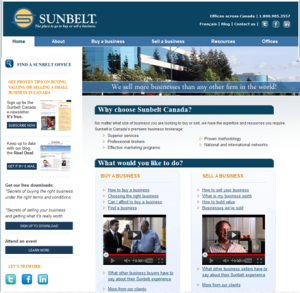 We added landing pages for download items so we could capture emails and build prospect lists tied to our Sunbelt Canada newsletter. We made it easy to connect with us on twitter, Facebook, and LinkedIn. Integrating your social media is key—all should be driving visits to your website, your content hub. 4. We wanted our site to be professional, intuitive and inviting, setting the stage for a mirror site in French to be introduced later this fall. While we would have preferred a somewhat different layout, our need to stay within the existing corporate content management system limited some of our options. 5. We’re also now collecting analytics so we can measure our site’s effectiveness and further refine our content to provide more of what our visitors want. Our subscriber lists are growing and we’re pleased with the results to date! Looking for tips on buying, building or selling a business? Make sure you sign up for our free monthly newsletter.